View cart “Baltic Amber Teething Bracelet – Cognac by Momma Goose” has been added to your cart. Momma Goose’s Baltic Amber Teething Bracelet in Cherry is dramatic in a dark red, nearly black color. Made with true baltic amber beads, this cherry teething bracelet for babies offers a natural and safe way to relieve baby’s teething pain. Amber is fossilized tree resin that contains succinic acid, which offers anti-inflammatory and analgesic properties. 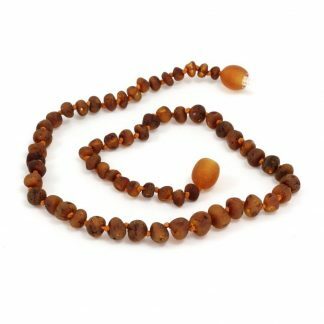 When your baby wears this amber teething necklace, his/her body heat causes the amber to release succinct acid. This healing ingredient gets absorbed into baby’s skin and goes into the bloodstream. As a result, your baby gets the anti-inflammatory and pain numbing benefits. Succinct acid acts as a pain reliever to block pain and reduce inflammation. Your baby will begin to feel better soon. 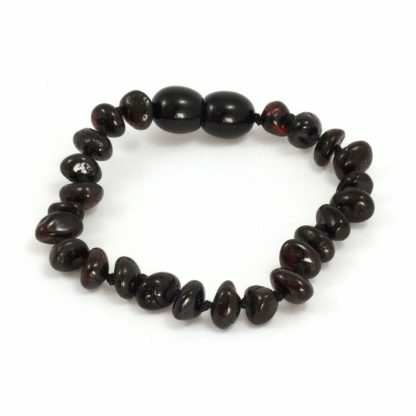 For safety reasons, do not allow your baby to chew on the baltic amber teething bracelet. Remove the bracelet whenever your baby is unsupervised, including when he/she is sleeping. Momma Goose bracelets are made with safety in mind. Each bead is individually knotted on the string, so that if your baby were to break the teething bracelet, only one bead would go free. The beads are also very small (smaller than a pea), so there is minimal choking risk. Not for Chewing – Baltic amber teething bracelets are not for baby to chew on. They are just for wearing. Maximize the Benefit of the Amber – To get the most therapeutic use from the baltic amber teething bracelet, your baby should wear it for as much as possible. It is NOT recommended for your baby wear the bracelet when he/she is sleeping or any times that he/she is not supervised. However, you can place it around your baby’s ankle inside his onesie when he’s sleeping. Should You Buy a Teething Bracelet or Necklace? – The choice between an baltic amber teething necklace or bracelet is up to you. Get one of each! But as a rule of thumb, wearing the amber closest to the site of the pain offers the most benefit. So, for teething babies with sore gums, a necklace is usually better. However, bracelets are an excellent choice, especially when worn around the ankle inside a one-piece, inaccessible to your child during sleep. 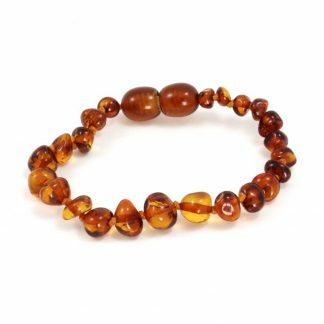 Care and Clean Instructions – Keep the amber teething bracelet away from lotions, waxes, polishes or any other residues that can coat the surface of the amber stones. 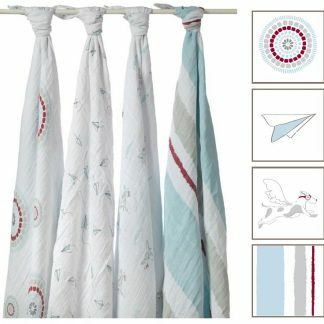 These will create a barrier between the healing succinic acid and baby’s skin. Your baby can wear the baltic amber teething bracelet while bathing, but not in a pool where chemicals can be harmful to the amber. If you want to wash the bracelet, use warm water only. No soap.